I realize that I’ve written about olive oil before, but as I spend more time in Italy and have more opportunity to talk with producers, growers and cooks as well as tasting more oils, the more fascinated I become with all the details about olive oil. The history, the benefits and the lies, as well as the rationale and need for DOPs. The DOP is the designation the Italian national government has taken to ensure that all traditional products are held to a strict standard for quality, excellence and originality) D.O.P – Denominazione di Origine Protetta. In particular this applies to Extra Virgin Olive Oil and signifies that the oil has passed all the government tests for quality and acidity levels (extra virgin olive oils must be no more than 0.8% in free acidity and be cold pressed. The lower the acidity, the better since it provides better health benefits, among the many reasons. These days we find that it is difficult to trust much of anything we hear or read about our food. We are “sold” on health foods on the internet without much documentation, we are in farmer’s markets buying food that has been brought by people who have never been to a farm and have no idea what has been put on the food they are selling. It is difficult to buy almost anything with much confidence that the label is truthful, the information accurate and the pricing fair. That is one of the reasons I have spent so much energy and time asking questions, talking to growers and finding people and resources that I can confidently believe and relay what they say to you. These are small purveyors not exporting, not supplying distributors, just growers or consortiums. People I trust. If you get bored or find this information too tedious I understand. Skim, or just look at the photos. It will be too much information for many, but it is here for those, like me, who want all the details. Now, for a little more on olive oil. Actually there will be a lot more. This is just part 1. The olive harvest starts with the Raccolta. — the harvest of olives from the trees. They use a giant-size plastic comb, or more often a mechanical mop top broom that kind of whirls around. You grab the branch, pull down and comb. The olives fall out like knots from your hair and the leaves remain. The nets lie around the trees on the ground to catch and hold the olives that are combed from the branches. Once finished, the olives are carefully collected from the nets and poured into the cestini (baskets). As the baskets are filled they are taken to the frantoio (olive press). Each region has it’s own rules for their DOP registration. But in general, the olives must be taken from tree to the frantoio witin 48 hours. With olio nuovo in Sabina, it is usually more direct. From tree to pressing within ten hours. No storing. Often the lesser quality olives can be stored up to three weeks before being pressed which means much of the nutrients and antioxidants and lots of freshness and flavor have already evaporated before they are pressed. Water jets on conveyor belts remove large particles of earth and foreign bodies, followed by the removal of olive leaves and small un-ripened fruit. The olives get pressed to produce a pulpy, usually violet-coloured substance, with no addition of heat or water. Though it is now done by mechanical means, it was traditionally done by grinding one stone around and around inside another larger stone, often pulled by a donkey or a horse, differing from region to region. I have friends my age from Sardinia who remember growing up with their olive oil being made like this. This is the important step of adding a recipe of movement, heat and time together to separate the pulp into diverse particles, therefore helping the microscopic oil drops unite into larger oil drops: normally 27°C for 15-20 minutes to get a high quality and low extraction. Normally, for top-quality extra-virgin olive oils, it is good to get 15kg of finished product for every 100kg of olives picked, this can change for each harvest. This machine separates the different particles produced by the gramolazione into: oil, vegetal water, and the remaining sansa or pomace, which is what the pulp is called. This final step takes the oil, adds fresh pure water, mixes them together and filters the water away which in turn removes further impurities from the oil. The oil is then taken and filtered through cotton, and bottled. PART 2 is a little more about the history and my reasons for staying firmly in Sabina for the oil I bring back. Hint: I love the flavor. Oh, and as you can see above, the Sabine hills are pretty spectacular. 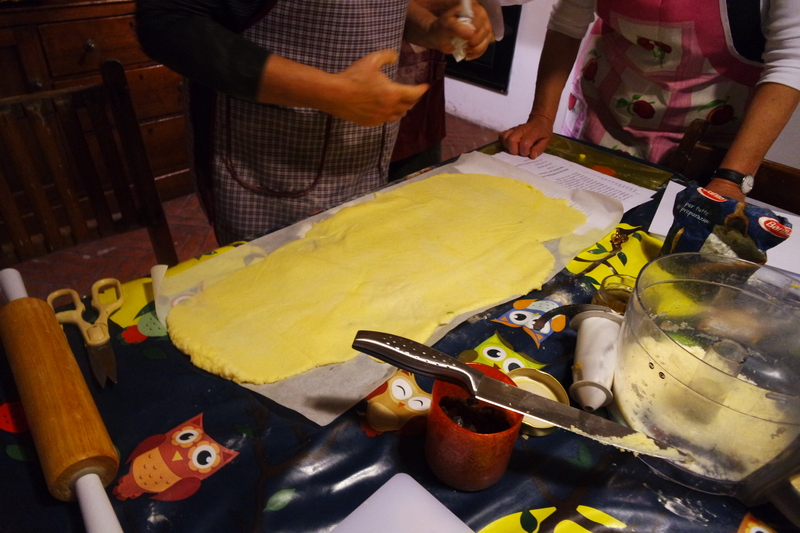 This entry was posted in Campo dei Fiori, cooking classes, Cooking Italian, Expo Milan, Italian food, Italy, Italy travel, Living in Italy, Mauro Berardi, Pasta, Rome, Sabina, Spices, travel, Tuscany, Uncategorized. 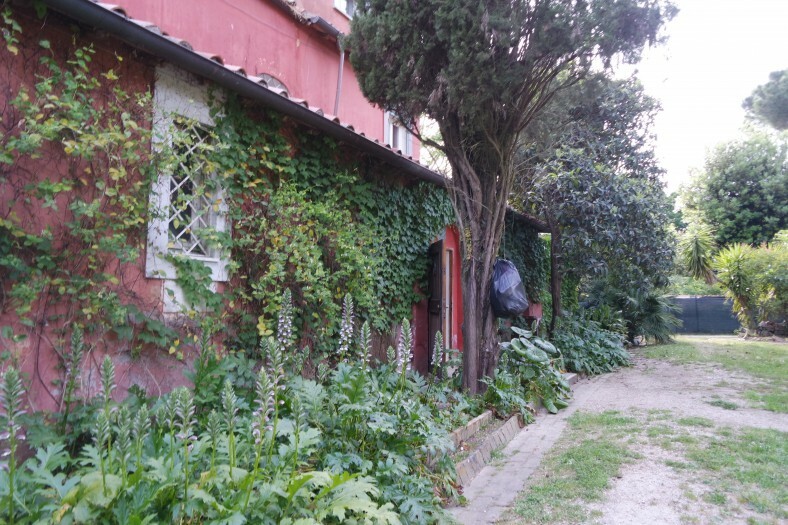 I am on my fall shopping trip to Italy and now that I have collected the olio nuovo from the frantoio in Farfa, and am a week away from collecting spice mixes from Mauro Berardi in Campo dei Fiori I have the opportunity to wander the countryside to visit some of my favorite places outside Rome. Vetralla is about an hour drive north on the Cassia through the lovely countryside of the Veii (through some Etruscan ruins). I take Cassia Bis since it is a more direct route and I love the caves of Sutri and often stop off at Ronciglione. Both are medieval cities with amazing history and buildings as well as fun festvals during the year. Ronciglione has one of the oldest Carnevale in central Italy. To open the festivities, the mayor gives the key to the city to the Carnival King, who rings in the week of madness that includes costume parties in the piazza, allegorical parades and a strange tradition of throwing pasta at passersby. The main event is a Palio competition initiated in 1465 by Pope Paul III Farnese, but unlike other Palio theirs features a riderless horse. But, this week, my mission is porcini secchi. I cannot take fresh porcini back to the U.S. but my clients have come to realize the stiff dark cardboard sold there as dried porcini are nothing like real porcini. And the best I have found are from a small farm outside Vetralla where the family grows, harvests and dries them by themselves. I have never been disappointed and neither have my clients. They are worth every penny and my efforts to shelter them to get them home. The shopping I do for my clients is very personal. I spend lots time resourcing to find the best quality, most reliable people and ask lots of questions so I can answer lots of questions from clients. Every trip brings new people and resources because friends in Italy want to share their finds with me. Tourists would never have the opportunities to locate the places and people I do, so I love sharing my finds. If you the chance do travel around more than the big cities of Italy. There is so much to see and explore. Every village has festivals and products that are unique. The more time I spend and areas I travel, the more in love I am with the whole country and realize there will never be enough time to explore all of it. Here’s an easy recipe for a porcini cream sauce using dried porcini to try. It can be used on pasta or any meat dish or almost anything. Combine porcini mushrooms and 1 cup warm water in small bowl. Let stand until mushrooms soften, about 30 minutes. Remove mushrooms from liquid, squeezing excess liquid from mushrooms back into bowl; reserve liquid. Place mushrooms in another small bowl. Heat oil in heavy large saucepan over medium-high heat. Add onion and garlic; sauté until onion browns, about 15 minutes. Add Marsala and white wine. Increase heat; boil until most liquid evaporates, about 7 minutes. Add rosemary, mushrooms and both stocks. Pour in reserved mushroom liquid, leaving any sediment behind. Boil until liquid mixture is reduced to 2 cups, about 15 minutes. Mix butter and flour in small bowl to blend; whisk into mushroom mixture. Simmer until sauce thickens, about 2 minutes. Season with salt and pepper. If you are not on my newsletter mailing list, you can be added by requesting to be put on it by emailing me at expresslyitalian@aol.com or clicking inquiries above. If you have any questions I am always happy to try to help. 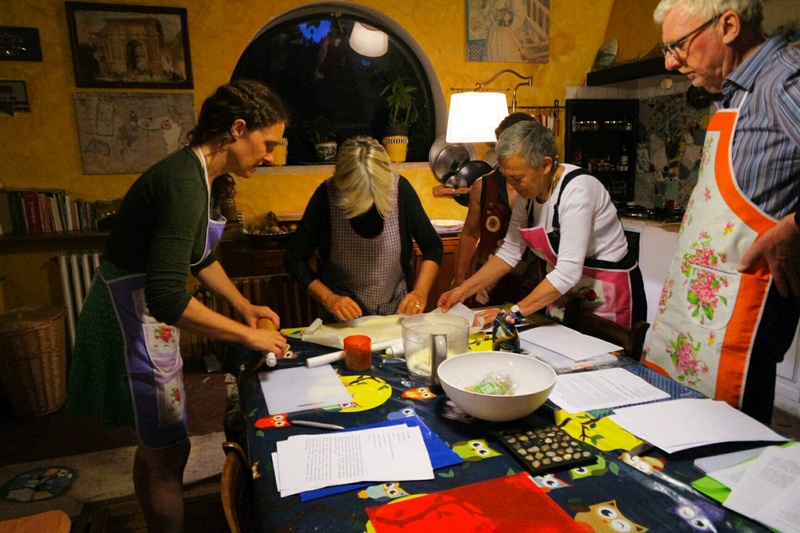 This entry was posted in Campo dei Fiori, cooking classes, Cooking Italian, Italian food, Italy, Italy travel, Living in Italy, Mauro Berardi, Pasta, Rome, Spices, travel, Uncategorized. If you have ever been to Rome’s famous Campo dei Fiori market you will recognize this spice vendor. Mauro Berardi is a third generation vendor in the market. His son Marco already has his own bancarella (booth) selling porchetta and meats as well as some condiments and sauces. If you want some of Mauro’s spice mixes, here’s a list of most of them. If you have any questions about how to use any of these or want the exact ingredients in one of them, just email me and I’ll be happy to let you know. All are the same high quality Mauro always has. In addition to the mixes, I usually also bring back some spices like cinnamon, cardamom and turmeric and sometimes cumin. Over the years I have found all Mauro’s mixes so much better than any others I’ve tried, while it is impressive the amount of spices he sells, all are still mixed by hand. All the spices are the highest quality available and much of them are freeze dried, which allows the potency to remain the same for at least one year or more if kept well. I have never had a complaint about his mixes, although admittedly, much of what I sell is to people who have already tried them after buying them from him in the market in Rome. Since he will not sell outside Italy, it is quite happy that I can help his clients while they cannot visit him in Rome. I am returning to Italy in late October for three weeks. And, while I will be on the hunt for olio nuovo and the first harvests of olive oil, I will definitely be stopping at the market in Campo dei Fiori before returning home. If you want any additional information or want me to bring you anything from Italy,or just have any have a question please email me at: expresslyitalian@aol.com. This entry was posted in Campo dei Fiori, Italian food, Italy, Living in Italy, Mauro Berardi, Pasta, Rome, Spices, travel, Tuscany, Uncategorized. Fall is here and I head to Italy soon. As September is fast closing, I am eagerly looking forward to my returning to Italy for fall. I have been hoping the weather there cooperates for great olive harvests throughout the country, but it does not look like the weather there has been helpful there any more than inmuch of the rest of the world. The droughts throughout much of Europe this year will have some impact on the harvests of olives and there is expected to be a slight lowering of expectations in the harvest from last year. The quality of the oils may not be quite as good as last year, but we won’t be sure until October. Some parts of Italy also saw some Mediterranean fruit fly infestations too. Fortunately, where I get most of the oil I bring back, Lazio and Tuscany, were not much bothered. However, I must also mention that the dollar is not doing all that well against the euro. It has been holding steadily at $1.22 to 1 euro for quite some time and I do not expect it to change much for awhile. So be prepared for everything to be a little more expensive. I have not yet heard much about the honey harvests for the fall. Last year when I went to purchase some of the fantastic honeys that I get from Sardina there were none. The production was so sparse that there were none to buy. I am hopeful that this year we will find a better crop and I can stock up on Stefano’s fabulous honey and olive oil soap too. I love fall in Italy and this year I have much to look forward to. I love each return trip to to my home away from home, visiting all my friends there. So many dinners to re-connect, introductions to new people, new products and new places to visit. It is always exciting. Always an adventure. Visiting the many markets and connecting with all my vendor friends again is so much fun. My regular clients will be putting together their wish lists of what they want me to bring back for them – spices from Campo dei Fiori, scarves from Florence or Milan, It is fun for them to know they will have porcini or black rice coming for them and trust that it is the highest quality possible. I love being able to bring them their sun dried tomatoes or porcini knowing they cannot get anything comparable here. And, of course there is Mauro Berardi’s spice mixes from Campo dei Fiori. Known world wide, he is a master at mixing spices together for the most memorable spice mixes. I have most of his most popular mixes available all year (and can always bring anything you order on my twice a year trips). Send me an email if you want to order any of his mixes by the ounce. Drop me an email if you want added onto my mailing list for the newsletter to purchase items I bring back on my journey: expresslyitalian@gmail.com. This entry was posted in Campo dei Fiori, Cooking Italian, Italian food, Italy, Mauro Berardi, Pasta, Rome, Spices, travel, Tuscany, Uncategorized. But of course, the main treat for me is meeting with Mauro, Marco and Maurizio at Spezie Famose nel Mondo the most famous and largest seller of spices in the market. I am contacted by people from all over the world looking to replace the spice mixes they purchase from Mauro. Fortunately I almost always have a good supply of the most popular mixes available. Contact me to find out if I have the ones you are looking for. I am off to Rome for the month of May so if you are looking for anything in particular don’t wait, send me a request by email to be sure I bring back what you are looking for. In addition to shopping for spices with Mauro, I will be locating Olive oil. I know there is oil available in Vetralla and hopefully I can acquire some additional oil from Farfa, where I brought back the fabulous olio nuovo in November last year. I won’t know until I get there what there might be available. I have read the articles about the weather problems, but since I deal directly with growers sometimes it can be misleading and my sources availability is quite different. I also will have to wait until I arrive to find out if there is any honey from Sardinia left. I know those harvests were also short this year. I continue to bring back what is available – sometimes it is mostly Girasole (sunflower) and millefiore (wildflower) but if you have a particular type you want, please let me know, since sometimes Stefano can locate it for me in his hidden places. Do not hesitate to email me with any special requests. I will be checking emails often. I will shop Milan, Tuscany (Orbetello, Florence and a few small villages) scarves from a few sources that are reliable with their italian fabrics and italian employees that are still priced affordably. And, if there are any new items that are interesting. It looks like the exchange rate will hover around $1.09 to $1.00 while I am there. If you are not on my mailing list please drop me an email and I will be happy to add you to my newsletter so you know what it available. Enjoy shopping Italy from home. 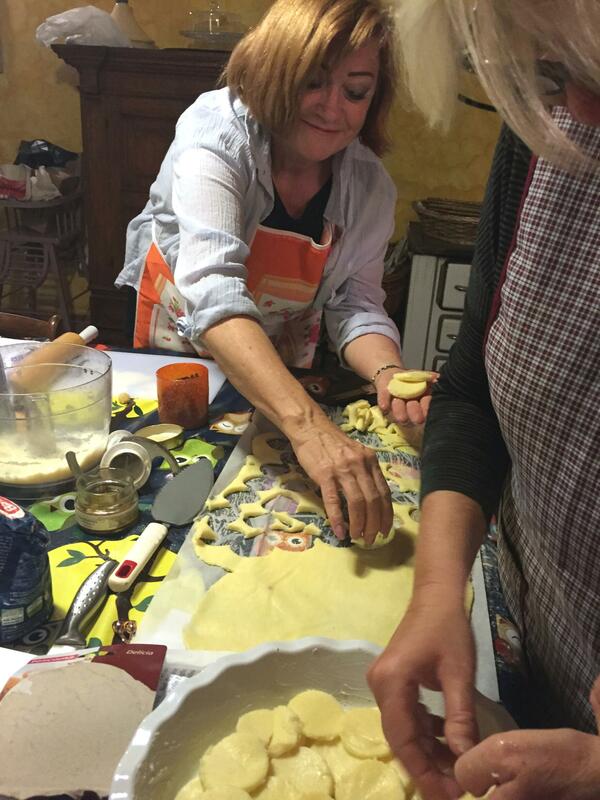 This entry was posted in Campo dei Fiori, Cooking Italian, Italian food, Italy, Mauro Berardi, Pasta, Rome, Spices, travel, Tuscany and tagged Campo dei Fiori, cooking Italian, Food, honey, Italian food, olive oil, Rome, spices, Tuscany. I have been more than a little lax in keeping up with posts this summer. I only wish it were because I was in Italy, but no such good fortune. But, as August progresses, I am already thinking of my next trip, which is for the month of October. I am putting shopping lists together already. Do not forget to email me if you want me to shop for you. In the interim, I wanted to share with you the recent posting of one of my favorite food writers, Rachel Roddy. Rachel lives in Italy (a British export) and has written a lovely cookbook, “My Kitchen In Rome”. Her style is simple, home cooking. Often in American cooking we forget the importance of even the most simple of ingredients. An Italian cook would never waste leftover bread and breadcrumbs are an important part of many Italian recipes. Of course, their bread does not have any chemicals in it and always breaks my heart to see anyone waste even a really stale piece of it. Here’s a recent column of Rachel’s. I hope you’ll try her suggestions. Swordfish with breadcrumbs and almonds was one of the first meals I ate during my first visit to Sicily 12 years ago. I was in Catania, at one of the trattoria that seem to appear from nowhere once the fish market closes down for the day and scrubs up well for the night. The appearance of that slice of swordfish, seeming slightly suffocated by its topping, surprised me – especially after the wild excitement of the theatrical fish market that morning. It was like meeting up with your grandma after a night out with friends. But it was delicious pleasing – I still remember the flavour. Lots more breadcrumbs and almonds followed – not always together – on that trip, and those that came after I hooked up with a Sicilian. Sicilians use breadcrumbs all the time; a resourceful habit born of necessity and the idea that you never, ever throw away bread, which is now part of the fabric of their cooking. I have picked up the habit; I always have a big bag of fine, dry breadcrumbs in the kitchen. They’re almost irritatingly good at everything: stuffing, puffing, coating, topping and a tool to stop things sticSo, the place I borrowed the idea from was a restaurant in a town calledScoglitti, which is 30 miles along the coast from us here in Gela. The owners’ daughter, who is part French, is absolutely fabulous, with her red lips, denim hotpants and ankle boots. There is not much room for manoeuvre; she tells us in a deep voice that rolls from her lips: “I know what you want.” And you don’t doubt it. The antipasti start arriving, little dish after little dish: an oyster each; peeled, blood-red prawns that are some of the most plump and pure I have ever eaten; slices of raw tuna and swordfish; cubes of octopus and butterflies of anchovy; enormous, yellow mussels stretching like acrobats across their shells; tiny clams called telline,tasting like a liquor made from sea water; sardines rolled up so they look like little fat birds; and spatola with almonds and breadcrumbs served with sweet onions. Spatola is a long, flat fish as silver and shiny as a newly minted coin. At markets and in shops spatola are often coiled, making them look a bit like a neat drawful of glittery belts. Ours were served as long fillets cut into short lengths, topped with breadcrumbs and almonds, then baked until the fish had fallen into delicate, but firm flakes, the crumbs a comfy crust. It was were one of the least showy dishes, but one we appreciated a lot, homely and good. My son stashed clamshells to take home in his pocket; I put the idea in mine. In the hope that this column is beginning to feel like a series, rather than string of unrelated episodes, I am starting where I left off last week, with breadcrumbs. More specifically, breadcrumbs with almonds, which makes them sound a bit fussy, though they aren’t. Quite the opposite in fact – a handful of crumbs, some chopped almonds and pinch of salt are easy and accommodating. Last week, I suggested toasting crumbs in olive oil, then putting them on pasta with slowly cooked courgettes, or their oversized Sicilian cousins, cucuzze. This week, I am going to return the idea to the place I borrowed it from, and suggest you put them on fish, which you then bake. Swordfish with breadcrumbs and almonds was one of the first meals I ate during my first visit to Sicily 12 years ago. I was in Catania, at one of the trattoria that seem to appear from nowhere once the fish market closes down for the day and scrubs up well for the night. The appearance of that slice of swordfish, seeming slightly suffocated by its topping, surprised me – especially after the wild excitement of the theatrical fish market that morning. It was like meeting up with your grandma after a night out with friends. But it was delicious pleasing – I still remember the flavour. Lots more breadcrumbs and almonds followed – not always together – on that trip, and those that came after I hooked up with a Sicilian. Sicilians use breadcrumbs all the time; a resourceful habit born of necessity and the idea that you never, ever throw away bread, which is now part of the fabric of their cooking. I have picked up the habit; I always have a big bag of fine, dry breadcrumbs in the kitchen. They’re almost irritatingly good at everything: stuffing, puffing, coating, topping and a tool to stop things sticking. So, the place I borrowed the idea from was a restaurant in a town calledScoglitti, which is 30 miles along the coast from us here in Gela. The owners’ daughter, who is part French, is absolutely fabulous, with her red lips, denim hotpants and ankle boots. There is not much room for manoeuvre; she tells us in a deep voice that rolls from her lips: “I know what you want.” And you don’t doubt it. The antipasti start arriving, little dish after little dish: an oyster each; peeled, blood-red prawns that are some of the most plump and pure I have ever eaten; slices of raw tuna and swordfish; cubes of octopus and butterflies of anchovy; enormous, yellow mussels stretching like acrobats across their shells; tiny clams called telline,tasting like a liquor made from sea water; sardines rolled up so they look like little fat birds; and spatola with almonds and breadcrumbs served with sweet onions. Spatola is a long, flat fish as silver and shiny as a newly minted coin. At markets and in shops spatola are often coiled, making them look a bit like a neat drawful of glittery belts. Ours were served as long fillets cut into short lengths, topped with breadcrumbs and almonds, then baked until the fish had fallen into delicate, but firm flakes, the crumbs a comfy crust. It was were one of the least showy dishes, but one we appreciated a lot, homely and good. My son stashed clamshells to take home in his pocket; I put the idea in mine. I like it when a new idea, flung into the kitchen like a rubber ball, bounces around enthusiastically seeing where it fits, or doesn’t. First, there was pasta, then I used breadcrumbs and almonds to stuff aubergines and tomatoes, then came the fish: spatola, bream and mackerel. All three fish worked, but the mackerel was best: its thick, milky flesh is a good, sturdy match for the coarse, nutty crust. Fish and breadcrumbs need a foil, something to offer contrast: sweet, sour, salty, pungent. A salad of tomatoes, red onion and capers is a brilliant and typically Sicilian combination. If you wanted – or three more people turned up – you could bulk out the salad with bread too, or top it with some salted ricotta. Whatever fish you use, it all comes together quickly, but provides slow, good-flavoured food that satisfies but doesn’t sink you, which is what I ask for on these long, and fiercely hot, summer days. 1 Line a baking tray with greaseproof paper or foil and preheat the oven to 200C/400F/gas mark 6. 2 Peel and slice the onion into half moons, then soak for 20 minutes in water acidulated with 3 tbsp vinegar. 3 Mix the almonds, lemon zest and breadcrumbs with a pinch of salt, some pepper and the oregano, if using. 4 Brush the fillets with oil, then press the fillet side into the breadcrumb mix, so it is well coated. Lay the fillets skin-side down on the baking tray. Zig-zag with olive oil. Bake until cooked through and the crumbs are golden – which will take 10-15 minutes depending on the thickness of the fillets. – yYou need to keep an eye on them, and taste. 5 Chop the tomatoes over a plate to catch the juices. Drain the onion and capers, then mix with the tomatoes. Dress with olive oil and a pinch of salt, add a dash of vinegar if you like. 6 Serve the fish with the tomato salad and wedges of lemon. Rachel Roddy is a food blogger based in Rome and the author of Five Quarters: Recipes and Notes from a Kitchen in Rome (Saltyard, 2015) and winner of the 2015 André Simon food book award. You can find her column in “The Guardian” or at Rachel Eats on wordpress. If you are running low on spices from Campo dei Fiori, I still have some available. Email me at expresslyitalian@aol.com and tell me what you want. 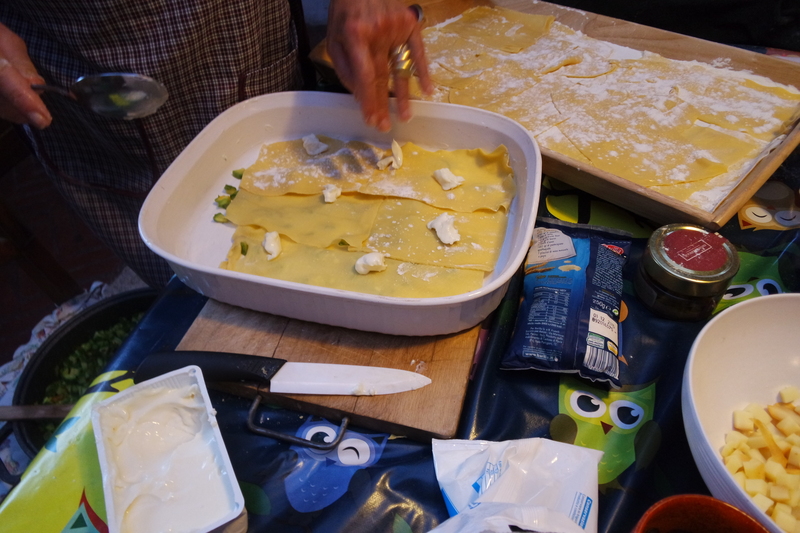 This entry was posted in Campo dei Fiori, cooking classes, Cooking Italian, Italian food, Italy, Living in Italy, Mauro Berardi, Pasta, Rome, Spices, travel, Uncategorized. I was fortunately able not only to meet Stefania on my last trip, but to take a class with Stefania. She is not a restaurant chef; she does not care about perfect presentation; she cares about the ingredients, the taste and preparing it with love. Her objectives are to use the highest quality ingredients, sharing her love of food and cooking, and sharing her knowledge with others. She particularly enjoys teaching english speaking students which is even better for me. Please check out her wonderful website http://www.follecasseruola.com. This fantastic site is not just great looking, it also has so much information you will have a difficult time deciding on which course to take. I was interested in meeting her and did not care what class was available. She not only teaches cooking for many regions of Italy, but also teaches some American cooking – she’s got a class on barbeque and one on Louisiana (with Jambalaya and Cajun shrimp)and even a class on American breakfast! Stefania has so much knowledge at her fingertips. And varied information it is. Stefania lived in Los Angeles for a few years and gave cooking classes there. She was integral to the beginnings of Gambero Rosa (the cooking channel in Italy) as well as writing for their magazine, among many others. In addition, Stefania has authored at least seven books: A Housewife in Hollywood, the Splendors and miseries of American eating; Dining with the Godsaditions. 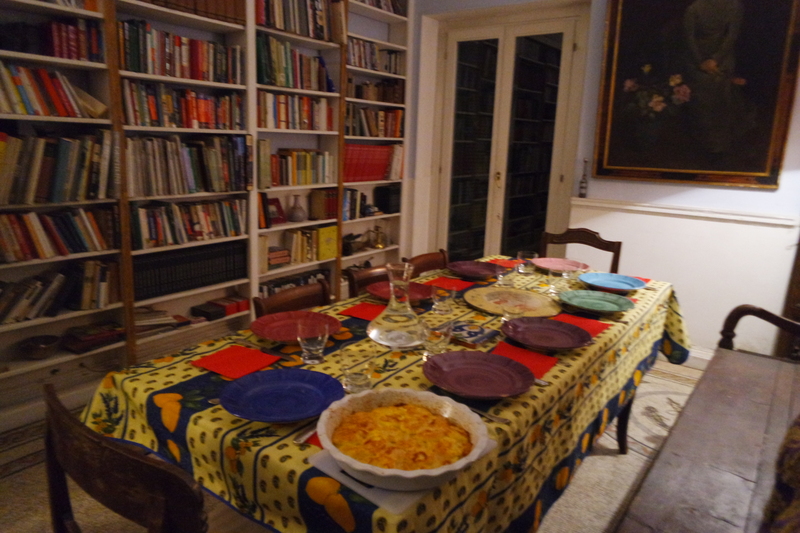 And, last year, she had published, “ One Hundred Fifty Years of our Country’s History told by Great and Small , Memories and recipes from the Aeolian Islands; So we ate, Fifty years of Italian history between the table and custom and Traditions. And, last year, she had published, “ One Hundred Fifty Years of our Country’s History told by Great and Small Cooks”. Stefania has stories of famous chefs of Italy and all about the regional cooking of Italy. It is truly an honor to have the chance just to chat with her. She’s charming, kind, a great cook and a wonderful writer. We are very fortunate that next year she plans on a teaching tour of the United States. I don’t know exact dates yet, or even the full itinerary, but New York, Atlanta and Los Angeles are definite. I’ve invited her to teach here and she is very happy to do that. I already have a number of people interested in signing up for the class. If you are interested, drop me an email and I’ll add your name to the list. Normally her classes do not have more than eight people. I think we can get enough people for her to teach at least three or four classes, in the spring of next year. The only class I could attend was a class on pasta. You can never have enough practice with pasta making, so I was quite happy to be able to attend this class “Le Mani in Pasta” (hands on Pasta). We cooked a Lasagna with Zucchini and cheese, Tagliatelle with Pine Nuts, anchovies and raisins and Gnocchi ala Romana (which is nothing like the traditional gnocchi. Stefania’s class was so interesting, I learned new techniques; more reasons to keep cooking Italian and how to enjoy the process from beginning to end. Eating all that wonderful food is exciting as well as filling. 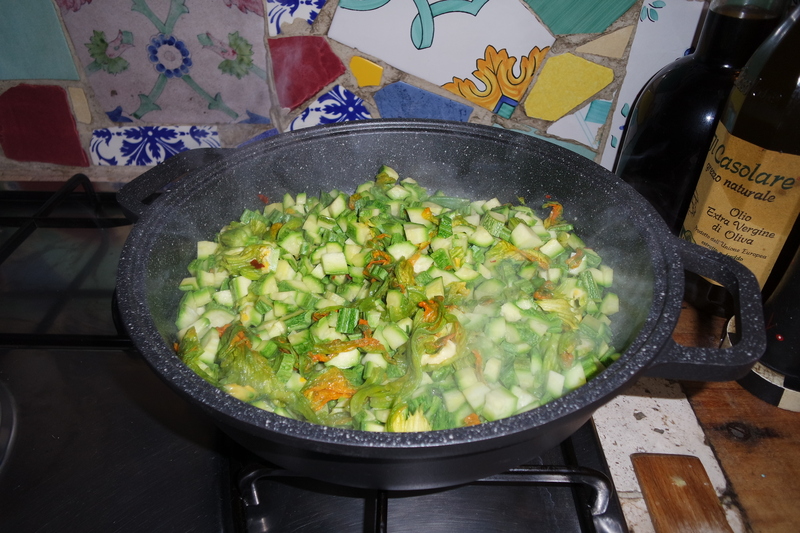 She uses all parts of the zucchini – blossoms and stems included. cheese. Another cheese I miss. I cannot wait for Stefania to visit Los Angeles to join classes here. Gnocchi alla Romana is a semolina pasta that gets baked. Really good! Taking a class while traveling can be a disaster or an amazing experience. Please do try to check out the person giving the class, the class sizes and costs. Some are ridiculously expensive. Stefania teaches and generously sprinkles the instructions with stories of her travels, the origin of the recipes and regional specialties. And, hers are some of the most reasonably priced classes I’ve taken anywhere. Please check out Stefania’s website: http://www.follecasseruola.com. It is both in Italian and English. If you plan on being in Italy, check out her schedule and take a class. It is a memorable experience. I love Gnocchi alla Romana and it is easy to make. This entry was posted in cooking classes, Cooking Italian, Italian food, Italy, Living in Italy, Pasta, Rome and tagged cooking, cooking Italian, Food, foods, Italian food, Italian travel, Italy, Mauro Berardi, stefania barzini. This is an exciting time – spring is bound to be hitting the whole country soon, Easter is almost here and the 2015 Expo Milano is almost ready to open! This Universal Exposition which takes place every five years, each time in a different country. This year, from May 1 to October 31, the 272 acres the Expo is on will be available for the world to enjoy. Expo 2015 is themed “Feeding the Planet, Energy for Life” with a focus on sustainability and innovation. All 140 participating countries will showcase their unique cultural and culinary traditions, within self-built lots, to the 20 million expected visitors from around the globe. Whew! That’s a lot of people, but it is a great amount of space to cover. And that’s without considering that there is also all of Milan to see. And, the Milanese have so many planned events in the city to entertain all the visitors it is a cannot miss trip. The layout of the Expo grounds are inspired by a Roman city of ancient times. The city has allocated over 60 pavilions in this ‘village’ to participating countries which will line either side of the long central division. 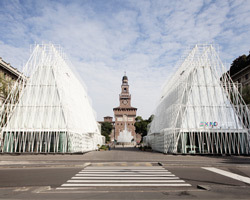 Italy’s exhibition area intersects to form a global meeting place called Piazza Italia. The space has also provisioned for event areas like the open-air theatre, Lake Arena and children’s park, as well as clusters for other official industry participants. I did not see that the U.S. Pavilion has a google map dedicated to it, but it is moving along quickly to completion. The US Pavilion – Designed by award-winning architect, James Biber, the USA Pavilion pays homage to our rich agricultural history with an open design delimited by a large vertical farm that will be harvested daily. An homage to the barn is reflected in the design of the pavilion. Located in central Milan for the duration of the Expo, the James Beard American Restaurant will showcase American cuisine, ingredients, and beverages with a rotating roster of American culinary talent. Thanksgiving dinner will be served every Thursday and Jazz or Gospel brunch every Sunday. Leading up to Expo Milano and throughout the six months of the fair, the USA Pavilion will be programming daily activities, on the topics encompassed by our theme American Food 2.0: United to Feed the Planet. From conferences on global food security to cooking demonstrations, panels on technological innovation in the food system to conversations with top farmers and chefs, we’ll explore various aspects of food, food culture, and the future of our food system. Topics will cover a broad and diverse spectrum, including how to manage water resources, the importance of food labeling, healthy school lunch, traditional American cooking, and how can we create a burger that’s better for our health and better for our environment. If you are planning on travel in Europe this year, be sure to put this on your itinerary. It’s really a unique experience that cannot be repeated. Being Milan, the city has really gone all out to provide an Expo experience throughout the entire city while the fair is happening. There are art events, fashion events, tours, and so much has been already completed to make the entire city ready for the spotlight. Among the most important events already on schedule, Milan will feature the biggest exhibition ever organized in Italy of Leonardo da Vinci with works of the Renaissance icon borrowed from Italian and international museums. Another exhibition will be dedicated to Giotto, the Florentine painter who revolutionized the depiction of figure in the 1300s, with three of his masterpieces on loan. International artists from avant-garde to today will represent the theme of motherhood that most of all embodies the idea of nutrition, central theme of Expo Milano 2015, in an exhibition, “The Great Mother,” gathering over 80 works of the 20th century. Music will be central, Del Corno added, with extraordinary programs at Teatro alla Scala, that for the first time will stay open in August with a total of 140 spectacles during the six-month expo, and Piccolo Teatro, which will perform in many languages including English, Chinese and Greek. “Milan will be a stage open to everybody,” the assessor went on saying. Duomo Square, in the heart of Milan, will host classic and pop concerts free of charge, while public spaces in the city from parks to trams will be animated by countless music performances, book fairs, street markets and thematic events including many dedicated to water. The architecture of the fair is wildly impressive. Here’s a photo of the entry gate proposal, I saw in Milan a couple years ago. This is the only structure that will remain after the fair. It’s by Nemesi & Partners and is a smog eating, almost zero energy building. It is exciting and I cannot wait to see this in person. If I sound excited, I am. I have already purchased tickets for my upcoming trip in April (they have a ‘soft’ opening starting this month), but also for my fall trip, in September. I’m leaving on my spring buying trip in late March! In addition to touring the Expo Milan, I’ll be shopping for all kinds of goodies to bring my shoppers. Fresh Sardinian honey and propolis as well as some of his propolis soap and beauty cream is high on my list. Honey from Sardinia is extra special since it is harvesting from one of the few pollutant free environs in the world. No wonder it tastes so good. Stefano has honey from a variety of locations on the island, since there are over 200 species of nectar producing plants, I get everything from Acacia and Ailanto to Malata and even Corbezzolo. From the Maremma I will bring some of their unique items like Colatura di alici da Cetara, and the purest fennel pollen available anywhere and some of the products from the organic small growers in the area like La Parrina and Terra Etrusco in Capalbio and near Il Poderino in Montiano. And, of course, the important stop at Campo dei Fiori for spices from Mauro Berardi’s Spezie famose nel mondo (world famous spices). Anyone who has visited that market seems to have purchased some of his spice mixes. And, they are not available anywhere else. He does not ship outside of Italy, but he is happy to supply me to bring them home and make them available to everyone. The most popular are the Campo dei Fiori Mix and Mauro’s Pasta Mix. Both of these have the same ingredients, except Mauro’s mix has no salt or pepper. This mix enhances everything it touches. Whether cooked or fresh, it adds a depth of flavor well beyond the ingredients listed. I use it in almost anything I cook from salads (where I sprinkle a small bit on the lettuces) to soups, meat marinades, and any pasta. If you’ve tried it, you are a fan, no doubt. Every trip brings special requests and new finds. If you are already on my newsletter mailing list, you’ll be kept up-to-date on my trip. If you are not receiving the newsletter, please send me an email and I’ll be happy to add you to the list. Don’t forget this is a great year to travel to Europe. The euro exchange rate is lower than in many years, currently about 1.10 euro to a dollar. 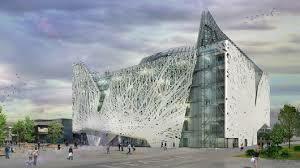 And, Expo Milan is a unique experience never to be repeated. This entry was posted in Campo dei Fiori, Cooking Italian, Expo Milan, Italian food, Italy, Maremma, Mauro Berardi, Pasta, Rome, travel and tagged cooking, cooking Italian, Food, honey, Italian food, Italian travel, Italy, Mauro Berardi, Milan, Shopping Italy, travel, Tuscany.